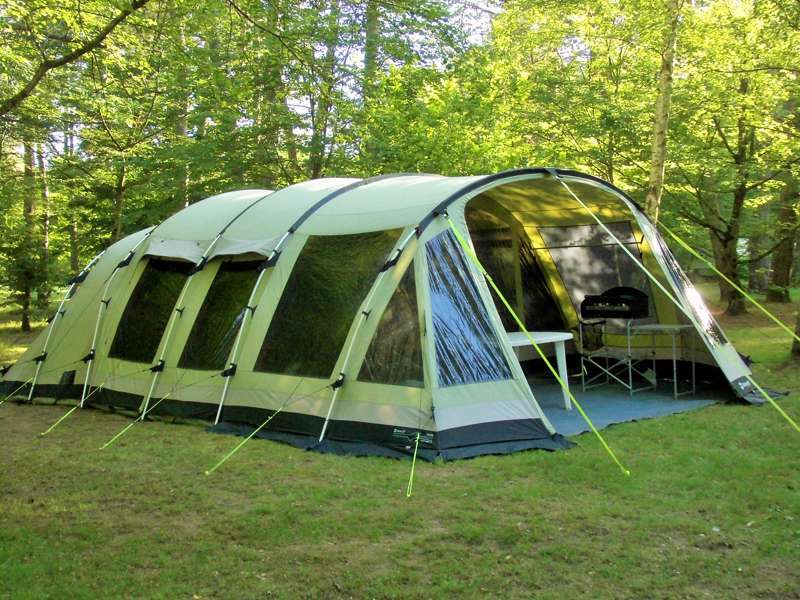 A pre pitched tent set in a spacious pitch on a beautiful woodland site, the large tent has 1 double and 1 twin bedroom all with comfortable mattresses and a further single bed can be placed in the living area which has comfy chairs. The kitchen area has cooking facilities, refrigerator and storage units. The vast, 26,000-acre forest of Tronçais is one of France’s little known treasures. Planted by order of Louis XIV to supply wood for the French Navy, it is one of the largest swathes of oak woodland in Europe. Today it’s better used to supply some of the finest cognac and Bordeaux win barrels in the world, lending oaky notes to that bottle of plonk you share around the campfire. On the north-west edge of the forest, with some pitches enjoying the shade of ash and birch trees, Camping Champ de la Chapelle is a family-friendly, quintessentially French campsite, where the atmosphere is thoroughly laid back. Activities range from cooling off in the pool and clambering on the climbing frame, to more ad-hoc opportunities for fun, such as building dens in the woods or taking a trailer ride behind the tiny blue campsite tractor. Facilities are well kept. As well as the regular ablutions there are baby-changing rooms, disabled access showers and fridges for campers to use. There’s an on-site bar and café and fresh bread delivery each morning, while those happy to forego the campsite’s mainly electrified pitches, can occupy one of the twenty beautiful ‘wild camping’ spots at the far end, where things are at their quietist. Surrounded by trees, the campsite certainly feels properly cut off from the outside world and it’s a good place to come for that much talked about ‘digital detox’. It's an 8-minute drive or 45-minute walk to the nearest reasonable sized village, Saint Bonnet. Set beside a lake, it’s an excellent spot for a wilder swim than the campsite swimming pool and there’s a great beach right beside it for picnics. The shed-like tourist office in the village is a good spot to gather your bearings, too, before taking off by bike or on foot into the forest proper. Camping Champ de la Chapelle is found on the fringes of the magnificent Fôret de Tronçais situated in the rural centre of France. This area is the real France, medieval towns and villages are scattered across the whole area, not as tourist attractions but home to people whose lives are similar to that of those a century earlier. The 11,000 hectare forest, once the royal hunting grounds of the Bourbon kings, is home to an astounding variety of wildlife and birds and is criss crossed by walks taking in forest sculptures, some of the famous 300 year old oak trees and hidden spas. The forest, set in gently rolling countryside, is great for cyclists and walkers but remember to take a camera, stags, roe deer and over 200 species of birds have been spotted here. The Allier boasts over 500 chateaux, many open to the public and nearby the campsite is the Chateau of Ainay le Viell, The castle, now part of Jacques Cœur's tourist route, has been nicknamed "the little Carcassonne" (French: le petit Carcassonne) because of its circular shape. Today the castle is one of the best preserved fortresses of the 14th century and is known for its stunning gardens. Saint Amand-Montrond, a charming local town with an excellent Saturday market, has a Roman ampitheatre where reconstructions of gladiatorial events are staged and nearby is the famous gothic chateau at Meillant. Horse riging, zip wires and many other exciting activitities abound in the area or for a more relaxing day visit Saint Bonnet Tronçais, our local village, where a variety of shops are found as well as the lovely swimming lake with a sandy beach, perfect for a lazy day. The campsite covers 16 acres with only 80 pitches, 60 with water and 10 amp electric hookups, The pitches range from 100 – 300 square metres and are suitable for tents, caravans and motorhomes. The swimming pool, open June – mid September, is next to the bar café and drinks and a small range of meals are available during the day and until 8.00pm in high season, as is fresh bread which is delivered daily (except Mondays). For children there are two play areas, both situated away from the camping pitches. The play area by the pool is for younger children and has a sandpit and play tractors, swings and a see-saw and trampoline, the older kids have a large climbing and adventure playground. To keep the ‘dads and lads happy’ and of course any ladies, we have a nine hole ‘foot golf’ course. We offer guided forest walks, campfires to roast marshmallows and candle lit swimming sessions. 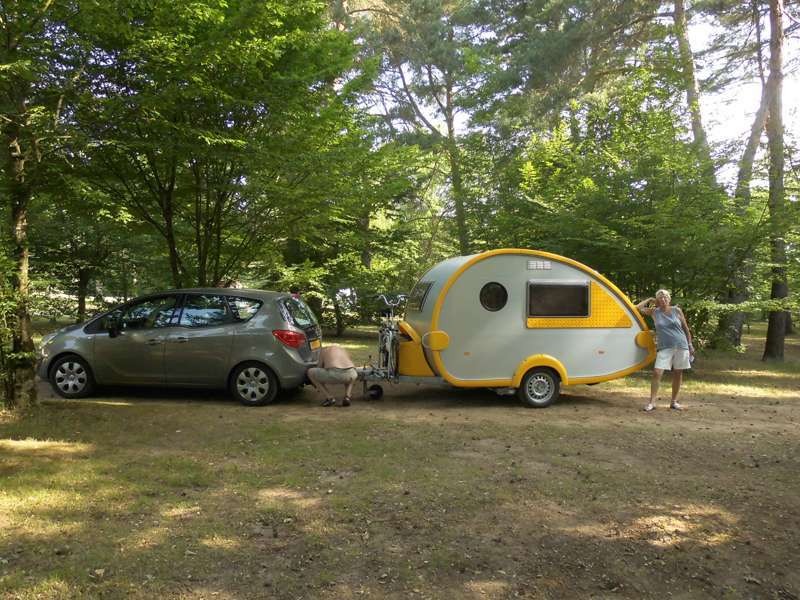 There are separeate ladies and gents sanitary faciliteis, a laundry room with washing machine and fridges for campers to use, baby changing facilites and disabled showers and toilet. Well behaved dogs are welcome. Never been camping before? 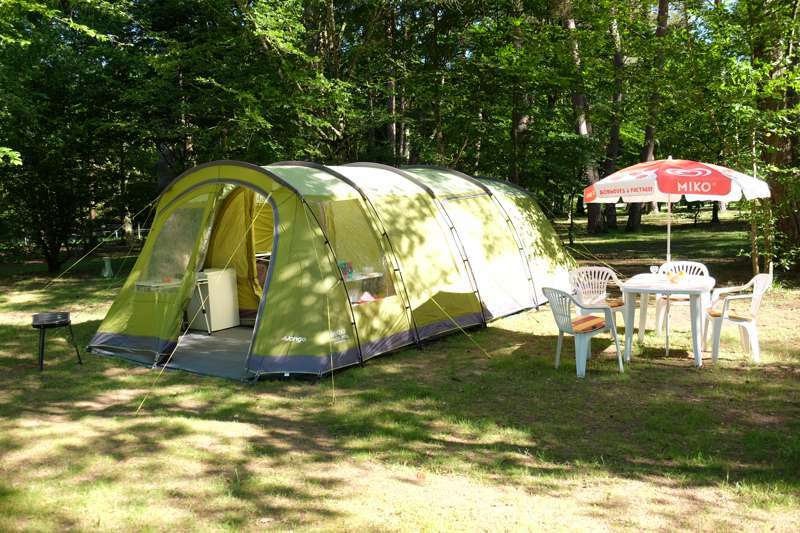 We have four well equipped rental tents, sleeping up to 6 people and a static caravan. We are also offering basic one night stop-over accommodation but as this is proving very popular please book well in advance. 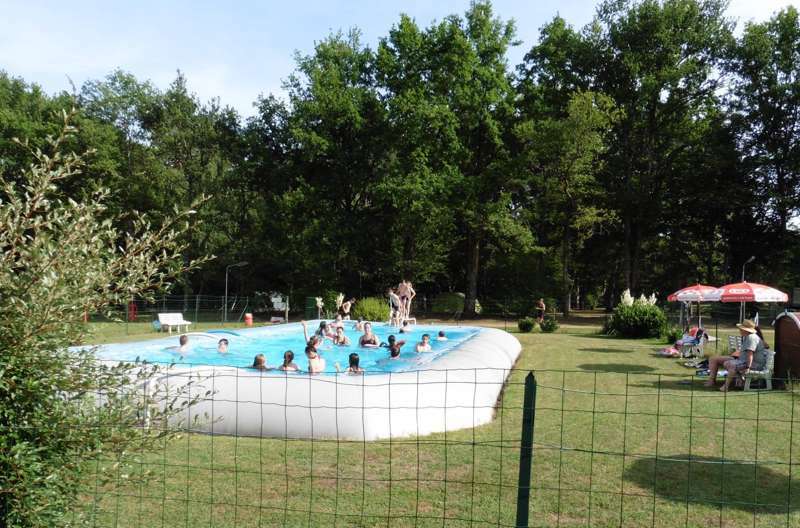 For latest availability and best prices for Camping Champ de la Chapelle, please use the Date Search above. Really enjoyed our time here. Relaxed atmosphere with kind and welcoming owner. Would recommend to all. Wonderful place with big old trees and shadow even in the hottest hours. A lot of space to enjoy. The situation just beside the lovely Fôret de Tronçais creates a very special ambiance full of harmony and with birds singing in the morning. There is a nice little lake with beach just a few kilometers away. Everything is very clean and well maintained. We will come back! 80 pitches, most with water and electric hookups, over 16 acres. Pre-erected tents and mobile homes also available to rent. Tents, campervans, caravans, trailer tents, families, couples, dogs – yes. Separate ladies and gents facilities – toilets, showers, basins – a laundry room with washing machine and fridges, baby-changing facilities, disabled showers and toilet. 2 play areas, one for younger children – sandpit, play tractors, swings, a seesaw and trampoline – and one for older children – a large climbing frame and adventure playground with a treehouse. Swimming pool (June–September). 9-hole foot-golf course. Maps, tourist info and a free library at reception. Bar-café; fresh bread delivery. Campfires permitted. 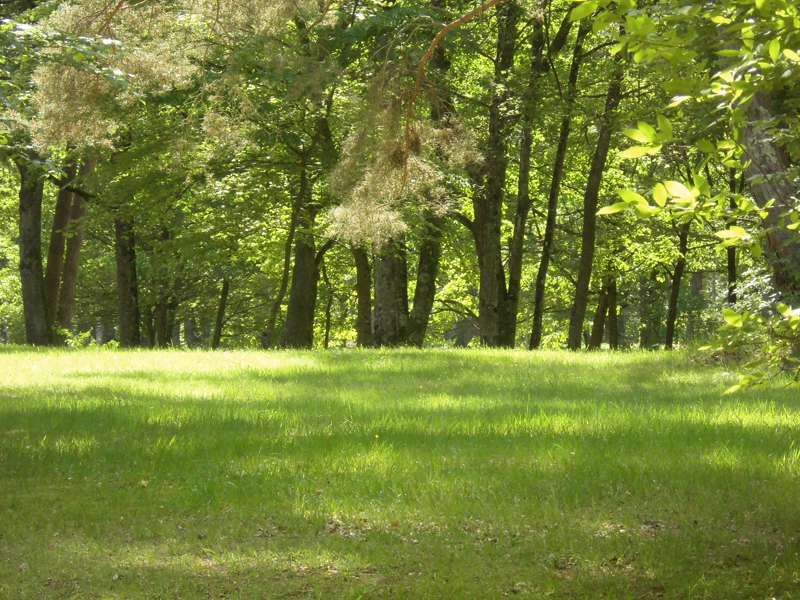 On the edge of the 26,000-acre Fôret de Tronçais, the campsite is well placed for walkers and wildlife lovers. It was once the royal hunting grounds of the Bourbon kings, and today is well populated with deer and birds and routed with footpaths and car-free cycling trails. Have a nose at the maps in the campsite's reception for details. It's a 15-minute drive to the 14th-century Château d'Ainay-le-Vieil (0033 2 4863 3614) which renowned as one of the best preserved castles of its age, recognisable for its circular shape. From there, it's 10 minutes more to the larger, riverside settlement of Saint-Amand-Montrond, where there's a good local museum (0033 2 4896 5520), an excellent Sunday market and a Roman amphitheatre where reconstructions of gladiatorial events are staged throughout summer. Closer to home, the campsite's local village Saint Bonnet Tronçais has all the essentials – shops, bar-tabac, a pizzeria and a doctor's surgery as well as direct access to the lake for swimming with a beautiful sandy beach. It's an 8-minute drive or 45-minute walk to the nearest reasonable sized village, Saint Bonnet Tronçais, which has the essential shops (as well as good access to a lake for swimming). There's a Casino supermarket there for stocking up and a tiny tourist office for getting your bearings. The local bakery supplies the campsite (order at reception the day before for delivery to the campsite) and a few yards from the tourist office there is a good pizzeria (0033 4 7006 3140) which also delivers. The campsite also has it's own snack bar and offers meals on certain nights during summer. From the North leave A71 at exit 8 and follow signs for Montlucon all the way through Saint Amand Montrond. When you have left Saint Amand, continue south on the D2144 and a mile after passing the village of L'Etelon turn left onto D798A signed St Bonnet-T and Foret de Troncais. After about 1½ miles you will come to a roundabout and the campsite is signposted from there. From the south leave the A71 at exit 9 and follow the D1244, following signs for Saint Amand Montrond. At Meaulne take the D28 and, about 3 miles up the D28, the campsite is signposted.